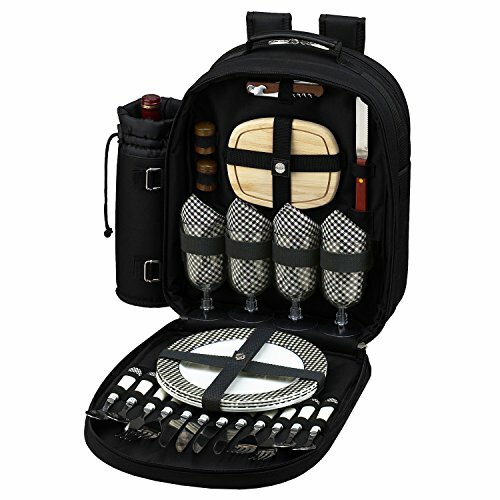 Fully equipped picnic Backpack for four with detachable wine holder & Thermal Shield insulated cooler section to keep food and drink at the perfect temperature. Includes combination corkscrew, hardwood cutting board, cheese knife, wooden salt & pepper shakers with non spill tops, acrylic wine glasses, 9" melamine plates, stainless steel flatware, and napkins. This picnic pack is constructed of 600D polycanvas. Designed and assembled in the USA. Lifetime warranty. Cooler compartment with removable heat welded leak-proof liner keeps food at the perfect temperature for hours - an insulated wine holder is attached to the side of backpack. View More In Picnic Backpacks.